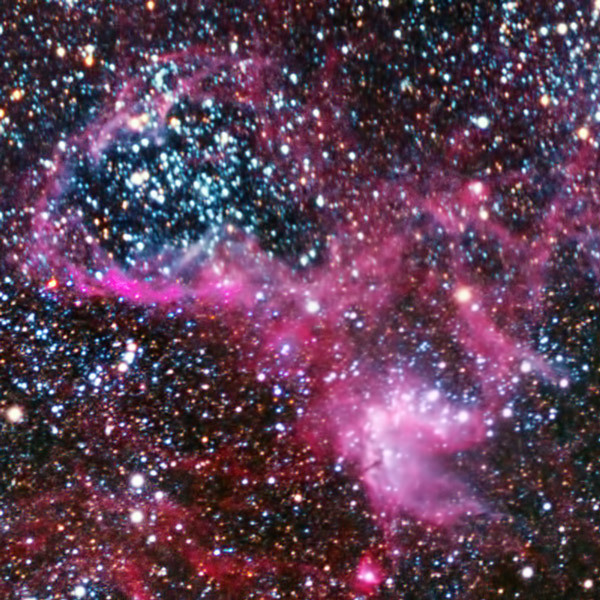 Visible as a faint "cloud" in the night sky of the southern hemisphere straddling the border between the constellations of Dorado and Mensa, the Large Magellanic Cloud (LMC) is a nearby galaxy, and a satellite of the Milky Way. 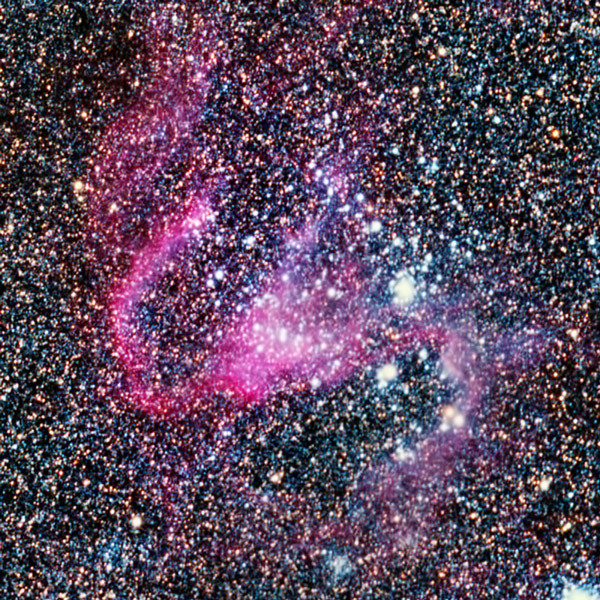 At a distance of about 50 kiloparsecs (≈163,000 light-years), the LMC is the third closest galaxy to the Milky Way, after the Sagittarius Dwarf Spheroidal (~ 16 kiloparsecs) and the putative Canis Major Dwarf Galaxy (~ 12.9 kiloparsecs, though its status as a galaxy is not certain).Its visual diameter is more than 20 times the width of the full moon. 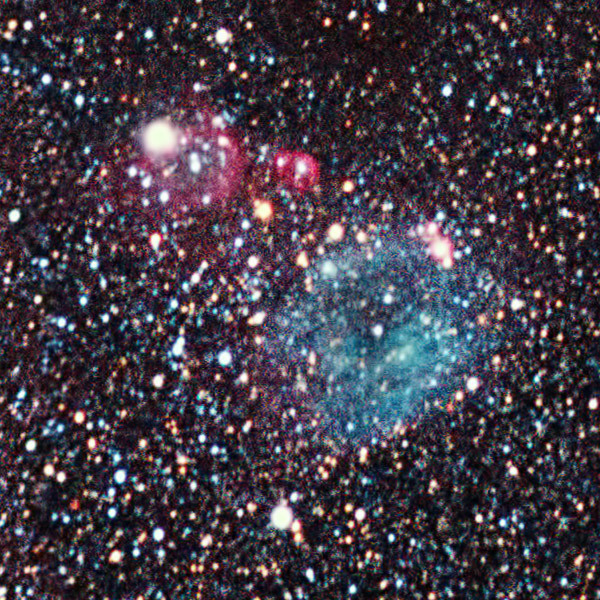 While the LMC is often considered an irregular galaxy (type Irr/SB(s)m), the LMC contains a very prominent bar in its center, suggesting that it may have previously been a barred spiral galaxy. 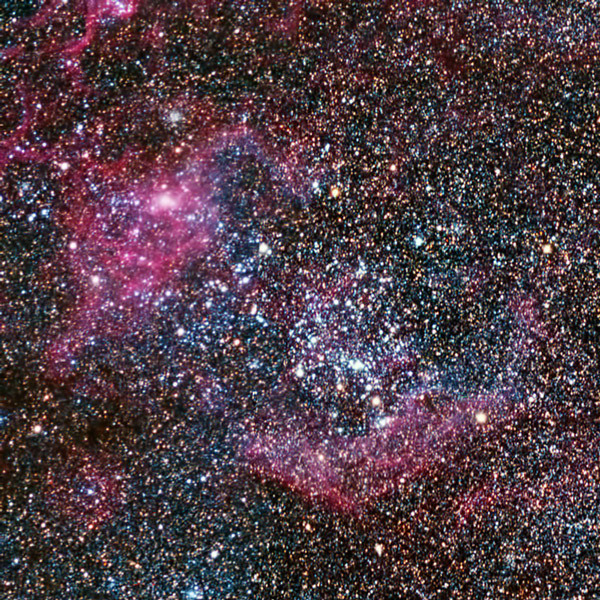 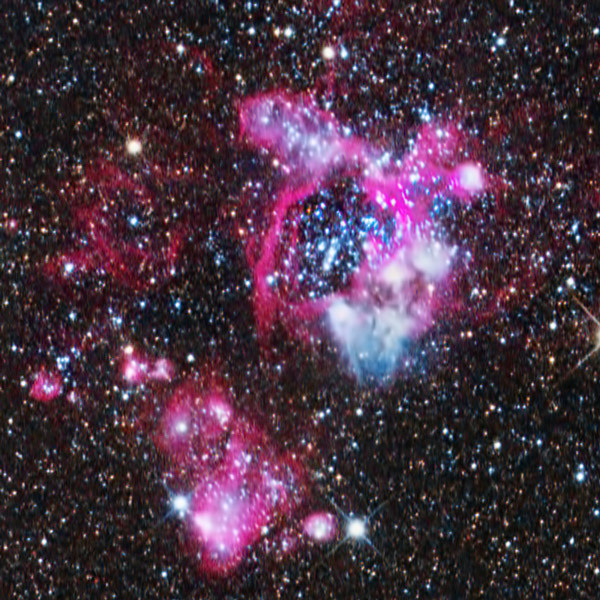 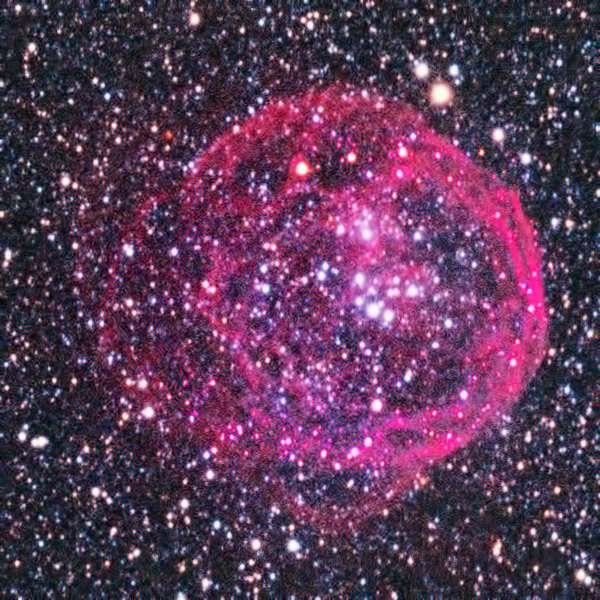 The LMC's irregular appearance is possibly result of tidal interactions with both the Milky Way and the Small Magellanic Cloud (SMC).It has a mass equivalent to approximately 10 billion times the mass of the Sun, making it roughly 1/100 as massive as the Milky Way, and a diameter of about 14,000 light-years (~ 4.3 kpc). 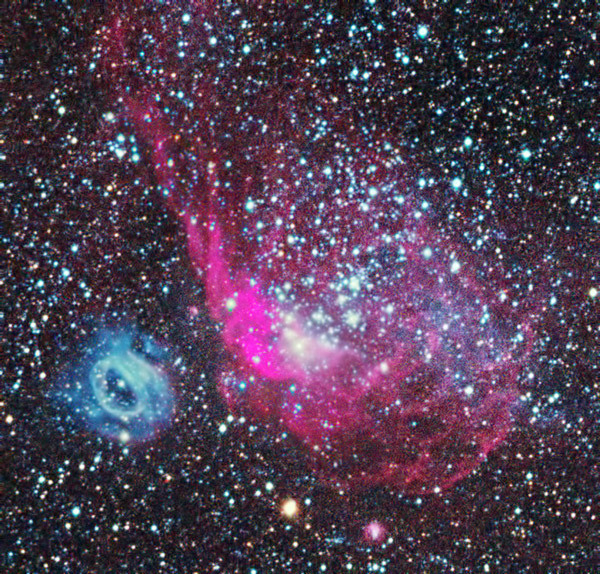 The LMC is the fourth largest galaxy in the Local Group, after the Andromeda Galaxy (M31), the Milky Way, and the Triangulum Galaxy (M33. 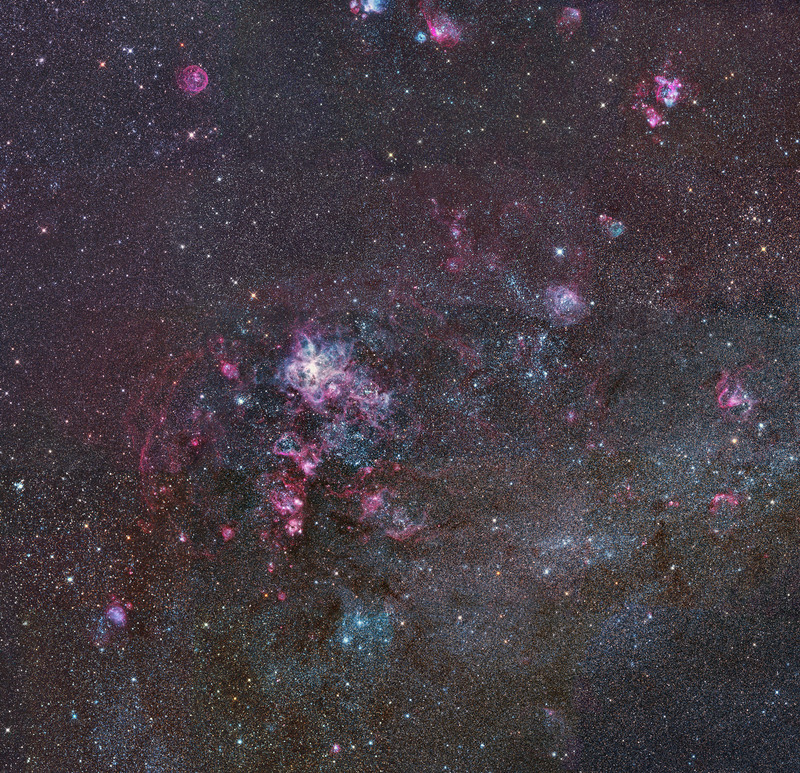 This huge 20 panel mosaic (the full-size dimensions are 11,710 x 11,314 pixels) covers an area of about 3.5 x 3.5° which includes the prominent Tarantula Nebula, as well as hundreds smaller objects (see the reference map). 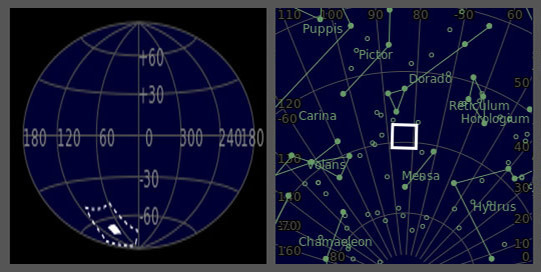 Puting the full-res image does not make sense, therefore below you can find eight 100% crops centered on some prominent objects. 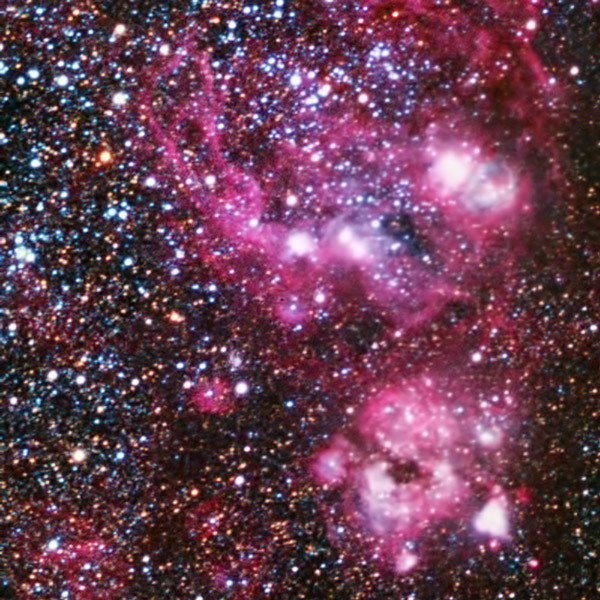 A photograph of the entire LMC can be seen here.